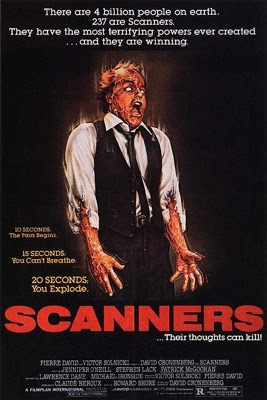 The Rockport Film Review: "Scanners" The Telepathic Cult Classic! "Scanners" The Telepathic Cult Classic! David Cronenberg is one of my personal favorite directors. He has directed other such films as "Rabid", "The Brood", and "Videodrome". "Scanners" was his fourth film and really thrust him into the spotlight of up and coming directors. Cronenberg’s films will usually have a sort of social commentary within the story. With Scanners, he seems to be warning people about the corporate worlds strangle hold on the public and making money at the expense of lives. Many of his movies involve some kind of naturally occurring disease or parasite that infects humanity and must be dealt with. A Scanner is a person who can read another person's mind. It is a telepathic sense that you are born with. Because of their abilities, they are often social misfits and stuck in a lonesome gutter of a life. Governments and corporations are all too willing to exploit them. The movie is most famous for a scene were a man's head explodes in front of a crowded auditorium. It was all apart of scanner demonstrating his abilities that went a little too far. This scanner is known as Darryl Revock, the leader of an underground resistance that refuses to be used. Our hero is Cameron Vale, a good guy scanner who looks a lot like John Travolta. Cameron is searched out by psychotherapist Dr. Phillip Ruth to help him combat the underground uprising. A pharmaceutical drug called Ephemerol is available to curb the negative effects of being a scanner. This dug has a very shady history as they find out towards the end. Being able to read a person's mind is not always as fun as it seems. 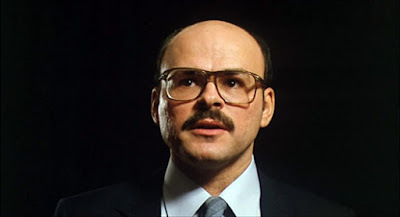 Scanners seem to be mostly men, although Cameron does meet Kim, a woman who joins him in his efforts. They are also on the run from members of the ConSec Corporation who want to use their powers for their own purposes. There are a few scenes and ideas in the movie that seemed to parallel the Matrix movies and remember this was made in 1981. Cameron goes into a phone booth and through the handset scans ConSec’s computer systems to get the names of the other scanners. The final credits are shown in a green computer screen type. Being a scanner is like living in another world, like being in the Matrix and in a time when the internet or even personal computers were not even available to the everyday person, this is quite impressive. This movie could have easily fallen flat and become a cheesy B-movie if the performance had faltered. The effects of the movie are top notch and anybody who knows a Cronenberg film knows that he loves realistic grisly violence. The final showdown between Cameron and Revock involves nothing but an epic staredown, but it works. Scanners are notorious for its violence, by it is so much more. Most all of Cronenberg’s films are independently made and financed, so they usually are not shown in many theatres. His last two films have also been his most commercially successful. With “A History of Violence” and “Eastern Promises” that both starred Viggo Mortensen. He always collaborates with the very best talent in all fields to bring really strong and influential material to the screen. "Night of the Creeps" - '80s Horror Classic! "Drag Me to Hell" is Heaven for Horror Fans! Eli Roth's First Gives You "Cabin Fever"
"Hostel Part II" Back for More Torturous Fun!